It's Friday! It's Friday! It's Freebie Day! Click HERE or the image above to go to the Lettering Delights website. Add the Old School More Play Cut It (svg) and the graphic set to your cart and check out. You pay $0! LD released their latest collection this morning- go see their new Old School Play and Old School Play On Words by clicking HERE. Can't get enough of the Old School stuff? Click HERE to see how you can get the original collection for FREE! 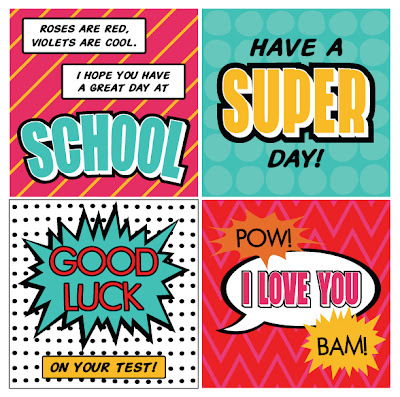 The Lettering Delights Back to School Dollar Sale ends tomorrow, Aug 31. Get your school-related graphics for as low as a buck and cut it(svg) for $2! scrapNfonts is a sister site of LD and they too have a freebie to give away today. 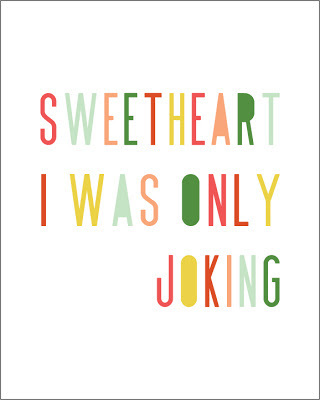 Click HERE to go to their Fontaholic blog to download their Sweetheart I was only joking print. You can make that into a poster or into a card. Also, click HERE to download their Super Lunch Notes for free. These printable notes were their freebie for last week but they were put up after I had published my freebie list so they were not included in my post. Luckily, the file is still available from their blog- just click HERE to get yours. 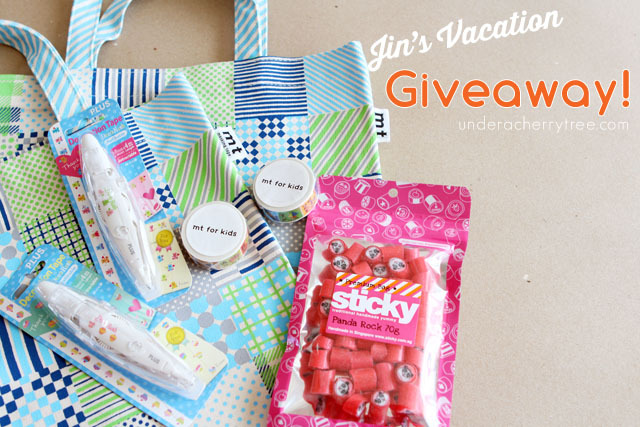 One more thing, my Vacation Giveaway ends tomorrow. If you have not already put in your entry, just click HERE for all the info. Panda Girl has a new giant panda! 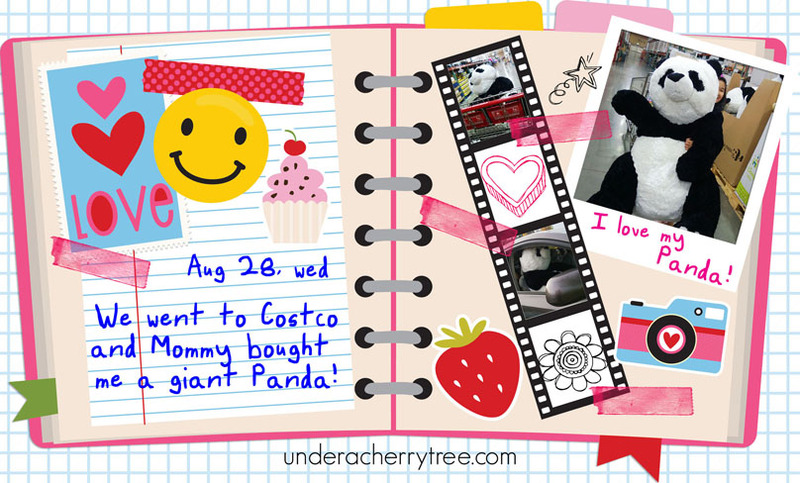 We were picking up some last minute school supplies at Costco last evening when we spotted a box full of 36" pandas. We had to put one into the cart immediately! So excited! The panda was so big it filled the cart. In case anyone is interested in getting one of these, here are some info that may help: the price of the bear is $29.99 and according to my receipt, the item number is 925687. It seems that not every Costco carries this item so you may want to call and check with your store first before making a special trip to get it. Have you used the recently-released Dear Diary stuff from Lettering Delights? I *heart* that line! I haven't played with the Cut Its/SVG from the collection yet but I used an image from the graphic set to make the "page" above. I'm not a scrapbooker so I created the page as though it were a SMASH book. It was fun! Who knows, I may just start scrapbooking one of these days. So now that y'all have seen pictures of my Singapore vacation, it's time to show you my loot, or at least part of, what I bought while overseas. 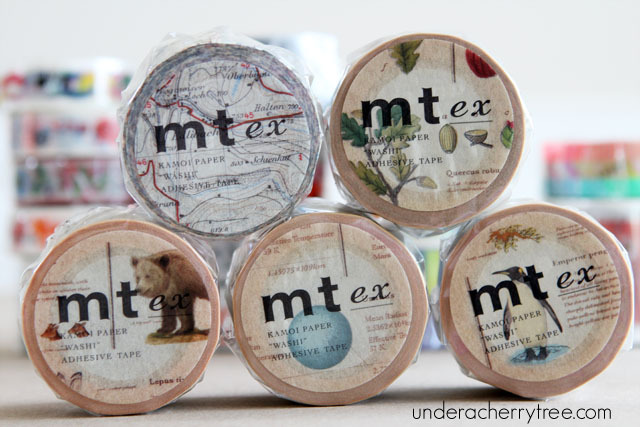 At every expo, MT Masking Tape would release special Limited Edition washi tapes just for the occasion. 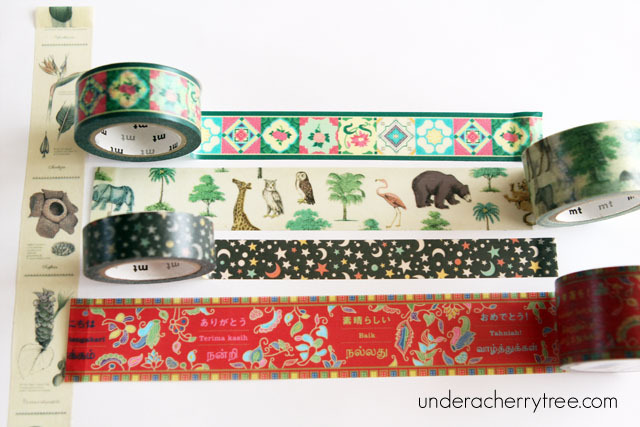 These 5 designs were the Limited Editions for the Singapore expo. As soon as I saw the new MT for Kids tapes, I just had to have them. 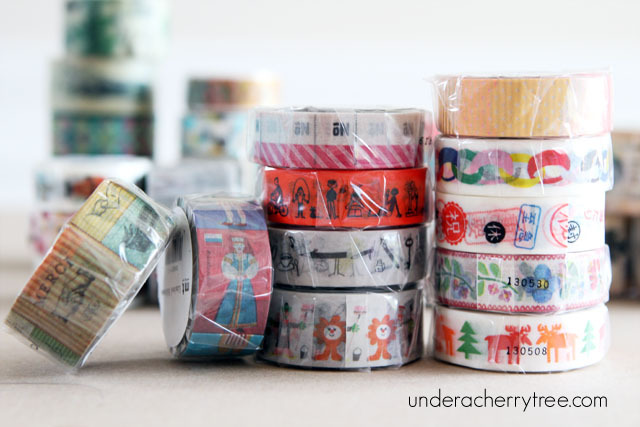 The rolls are smaller than the regular ones but the designs are super adorable! 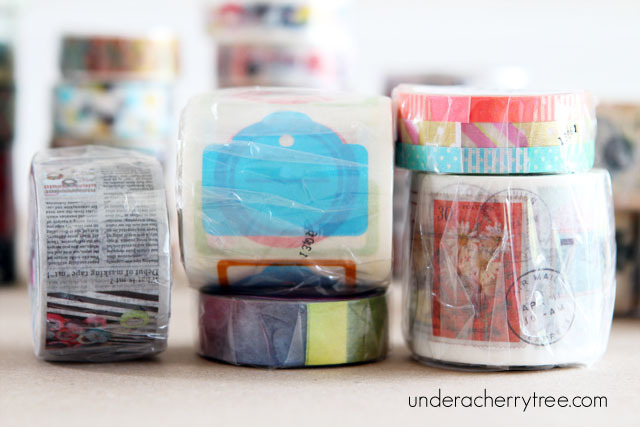 Who doesn't love flashcard-washi tape? Certainly not me! I *heart* them! I also bought these vintage-looking MT tapes. One is patterned with maps while the others are from the new MT Encyclopedia line. 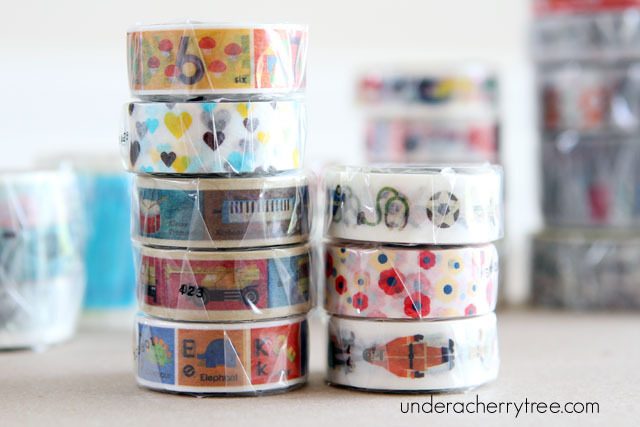 I love the newsprint and the tag tape and oh! 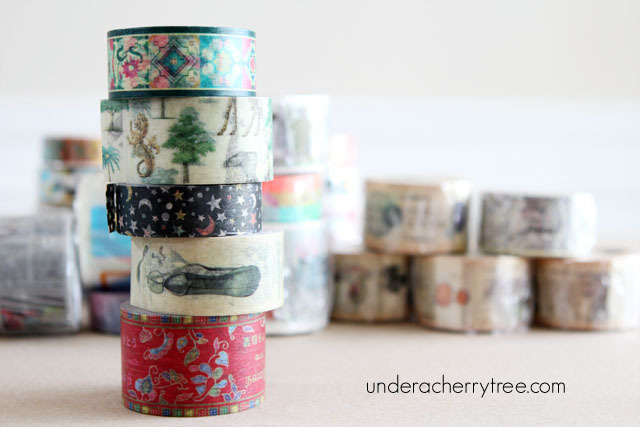 that postage stamp tape is gorgeous! 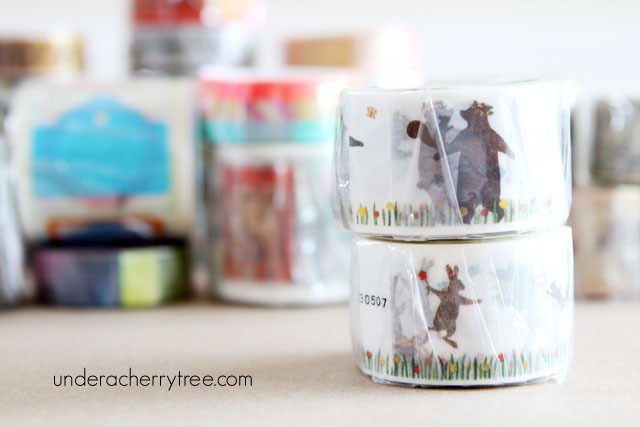 These bear and rabbit tapes are amongst my favorites. I bought the rabbit tape from the expo but the bear tape was sold out. Ivy Toh, a Singapore reader of this blog, surprised me with it when she brought me out on a night tour of the island. THANK YOU, IVY! 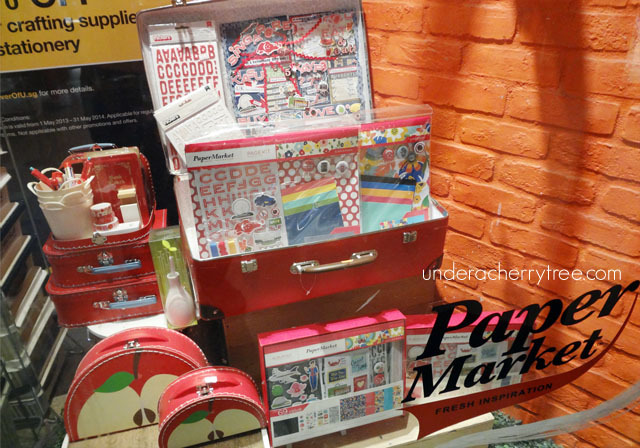 Speaking of Ivy, she also brought me to Paper Market in Raffles City. I was surprised to see such a big scrapbooking store in Singapore. They don't allow photos to be taken inside the store but they okay'ed a picture of their window display. Oh well. 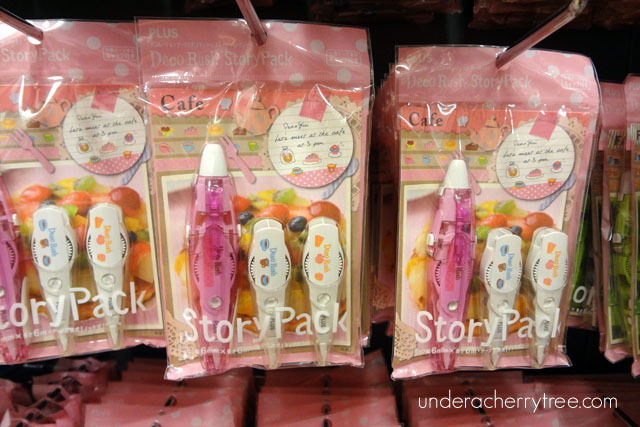 Popular is a major bookstore in Singapore and it was at their Bras Basah Complex location that Hubby spotted these decorative tape pens. I had never seen these before so I bought a few to play with. 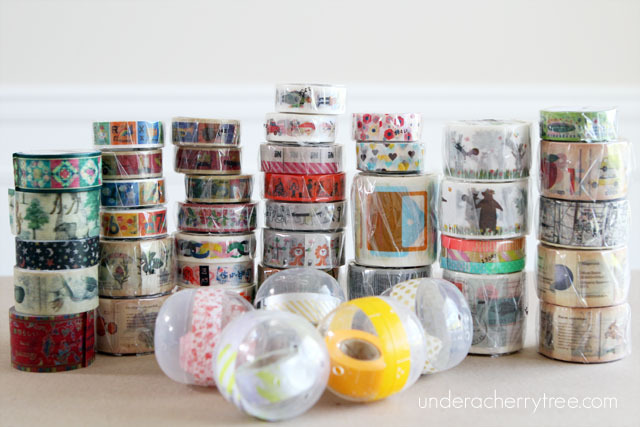 It turns out that they are retractable and refillable, roller decorative tape dispensers. 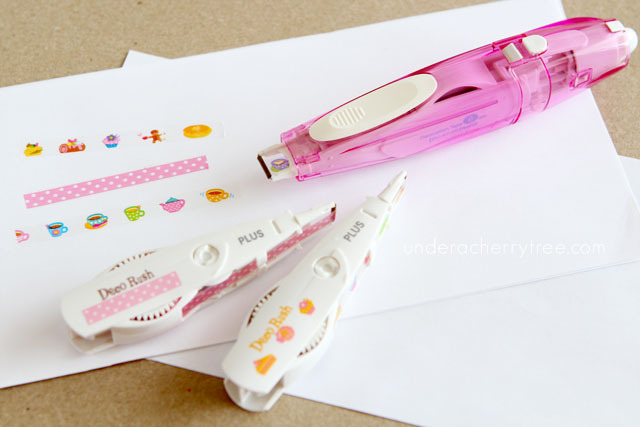 It works like a correction tape pen but it dispenses a patterned tape instead. 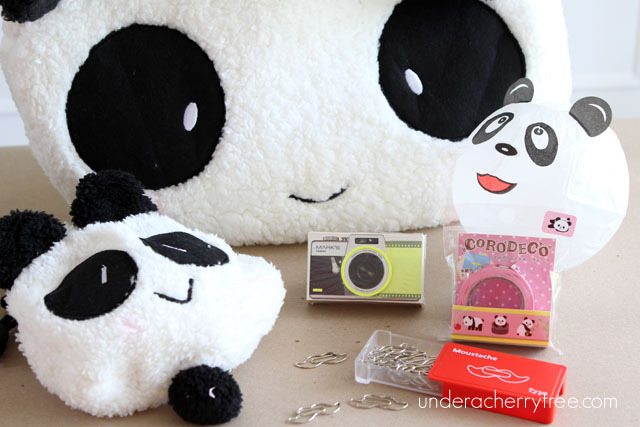 Some other random stuff that I bought in Singapore include a panda tote bag for Panda Girl (my 7-year old daughter), a panda drawstring bag for my Instax camera, and mustache paperclips. I picked up the panda paper lantern from the origami store in the Tokyo-Narita airport. Oh! I almost forgot to mention these two Singapore-themed scrapbook kits that my 10-year old twins really wanted. I don't scrap but the girls insisted that they need them for when they start scrapbooking about this vacation. One more thing, we also chanced upon the Sticky Singapore store while shopping at the Central Mall. They make and sell the cutest candies! Now that you have seen my loot, you must know that you were on my mind while I was shopping in Singapore. In other words, I picked up a few extras to share with you! 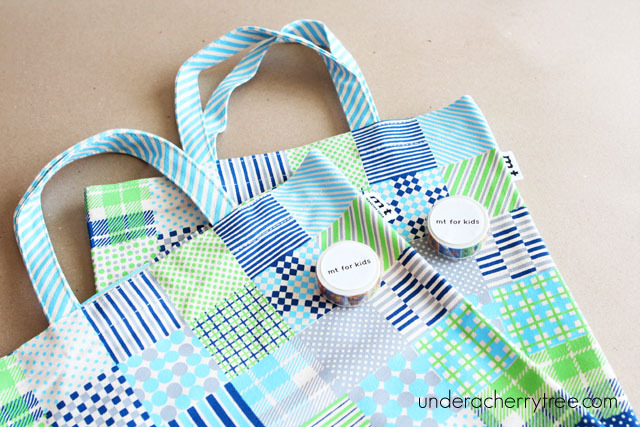 Two of you will win a MT canvas bag with 1 roll of MT for Kids washi tape each. 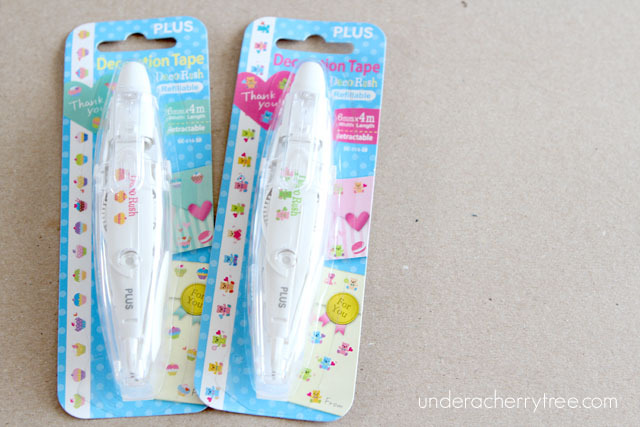 Two of you will win a PLUS Decorative Tape pen each. 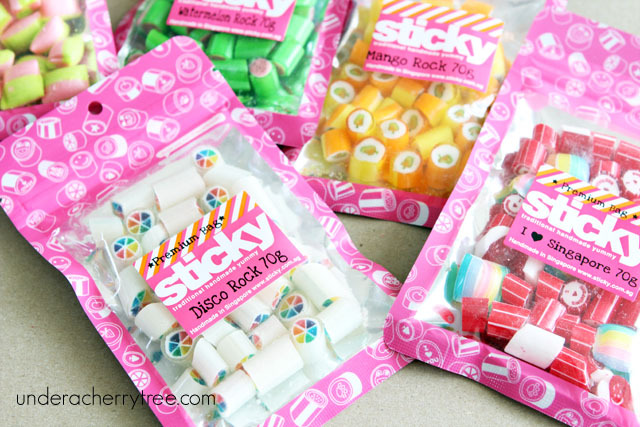 and one of you will win a pack of Panda Rock candy! The giveaway starts now and will end at 11:59pm PST, August 31. FIVE winners will be randomly picked and announced on Monday, September 2. Please note that this is a BLOG-ONLY giveaway and your comment(s) on my Facebook page will not count as an entry. That's all and so..... GOOD LUCK! Here's a hot deal for you from Lettering Delights: the School Spectacular Font Set is usually priced at $105 but LD has put it on sale for only $15! That's like over 85% off! I don't know how long this offer would last but if you have been waiting to get this 45-file bundle, now would be a great time to snag it. Isn't it crazy how fast time flies, especially when you're having fun? It has already been a week since we returned from our trip to Singapore! Our vacation came and went by in such a blur that I can barely believe that we really did make the trip. After years of talking about it, I am so glad that Hubby and I finally gave our girls a chance to experience the little island country. 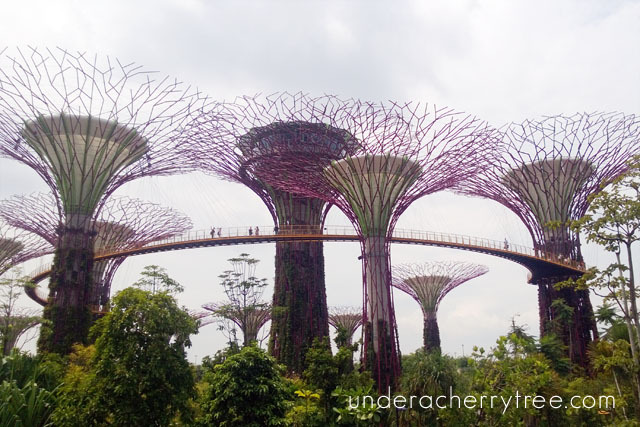 We wanted the kids to get as much out of this trip as possible and so prior to the flight, Hubby made all three write a list of things that they wanted to do and see in Singapore. 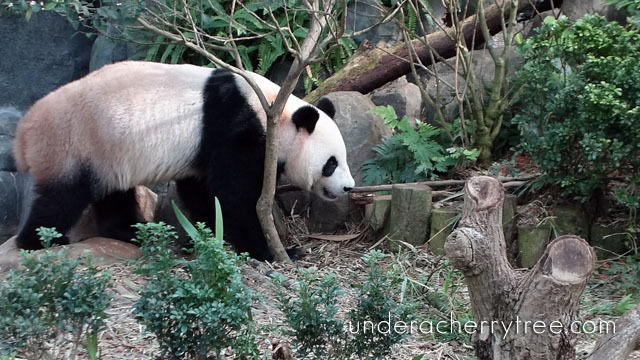 During the course of their research, they found out about Jia Jia and Kai Kai- two giant pandas that arrived in the River Safari last September. 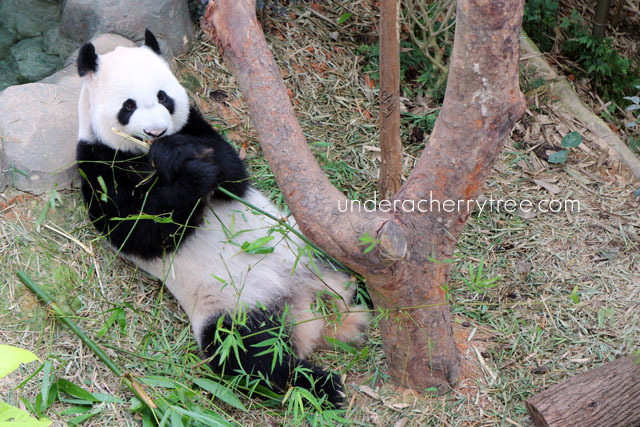 Given that my 7 year old is crazy about pandas, it was no surprise that a trip to the Giant Panda Forest was on top of our priority list. ...and Kai Kai busy having their breakfast! 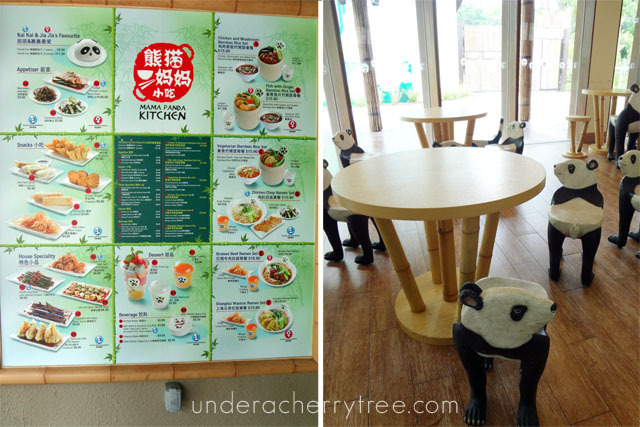 We also stopped by the Mama Panda Kitchen to have a bite. 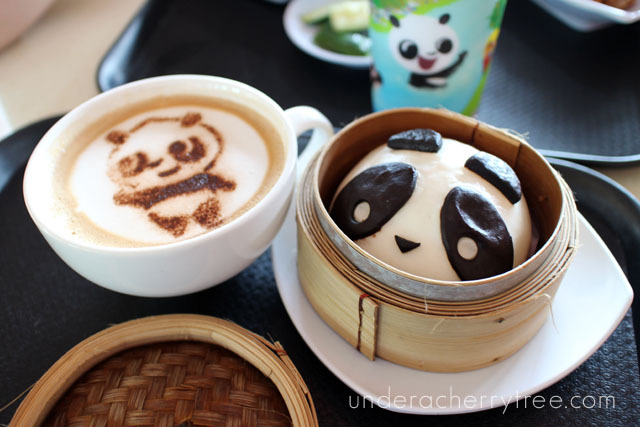 I love their panda furniture and decorations but most of all, I love the panda cappuccino and panda bao (bun with bean paste). 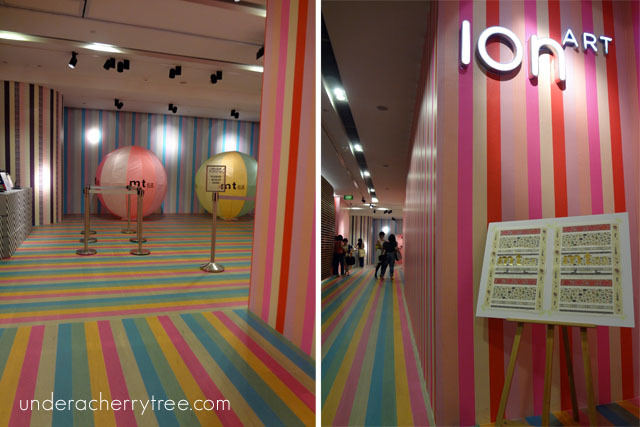 It was after our trip to the River Safari that I heard from Ivy Toh, a Singapore reader of this blog, about the MT Masking Tape Exhibition. The kids and I went to the fair 3 days in a row! If you had missed my post about the expo, click HERE to read all about it. 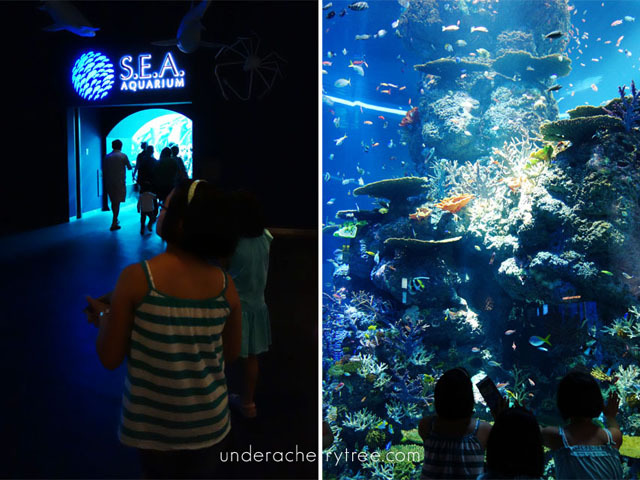 Another park that was on our Must-See list was the S.E.A. (Southeast Asia) Aquarium. 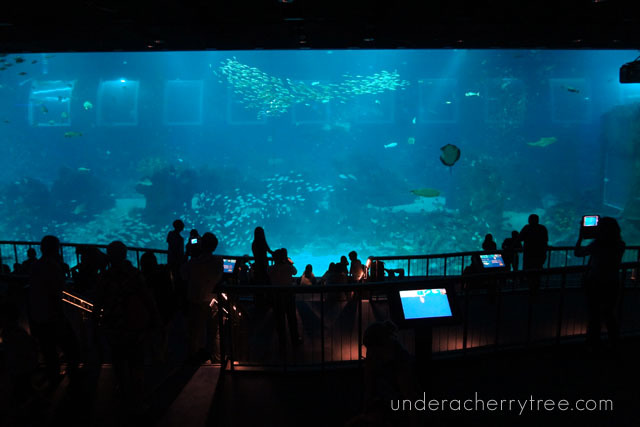 It is the world's largest aquarium with the world's largest acrylic viewing panel and so I was really curious. Just how big is it? 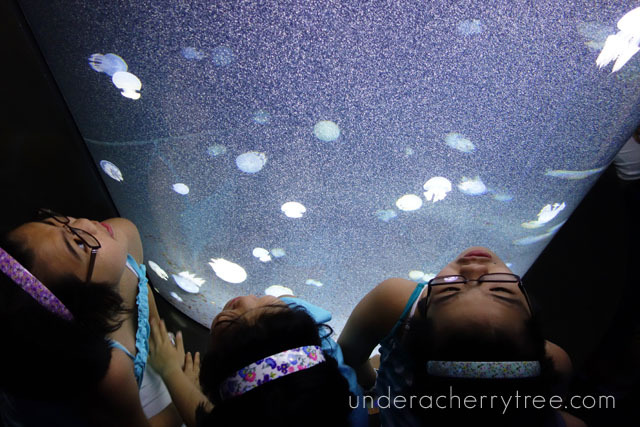 Before we saw the ginormous viewing panel, we stopped by to see the jelly fish and the dolphins. We loved the mini jelly fish but we really really loved the dolphins! It was SO COOL to see the dolphins swimming in the water and even more fun to see one of them totally taking in all the attention. 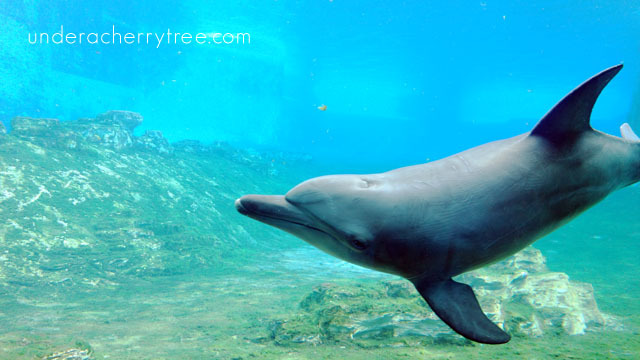 Check out this clip and see how the dolphin slowed down to take in every one of the "oohs" and "ahhs" that many of us let out in wonder as it swam by us. Then there's the giant viewing panel. It's huge! See those squares in the background? I learned from Ivy Toh that they are actually windows from the adjoining hotel rooms! How cool is that?! Here's a short clip for you so you can better see how huge this thing is. Also, look out for the manta ray and the school of fishies taking a ride on it. 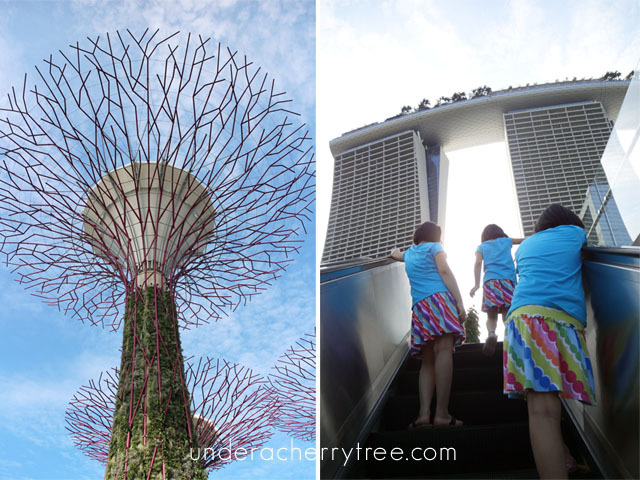 Thanks to Megastructures, my kids learned about Singapore's Gardens by the Bay. They had put the gardens on their Must-See list and there was no way they were going to let us skip this. 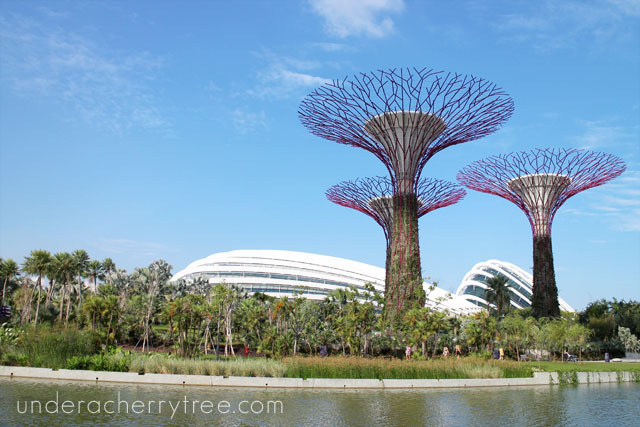 Here is a picture of the iconic Super Trees. I took this shot with my Windows Phone while on the Audio Tour (tram ride). Not bad, eh? 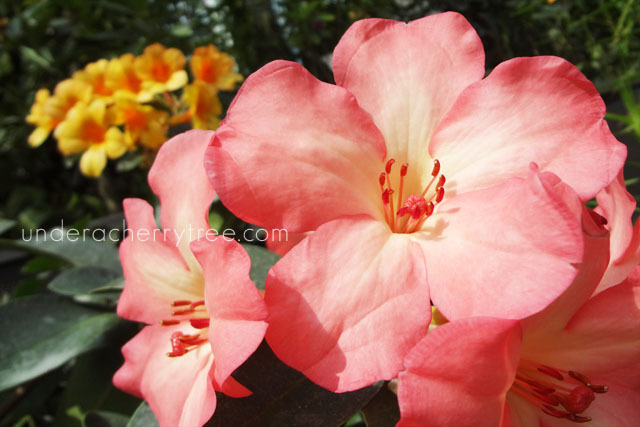 The plants in the Flower Dome and the Cloud Dome are spectacular. I really wanted to stop and take pictures of all the pretty flowers but then there are so many, I would have taken forever. This is the indoor waterfall inside the Cloud Dome. I loved looking at all the plants while we took a walk up to the top. 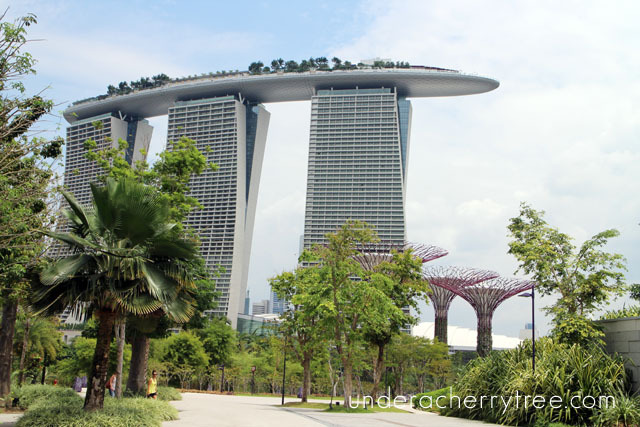 Another building that the kids learned about from Megastructures was the Marina Bay Sands Resort and Skypark. 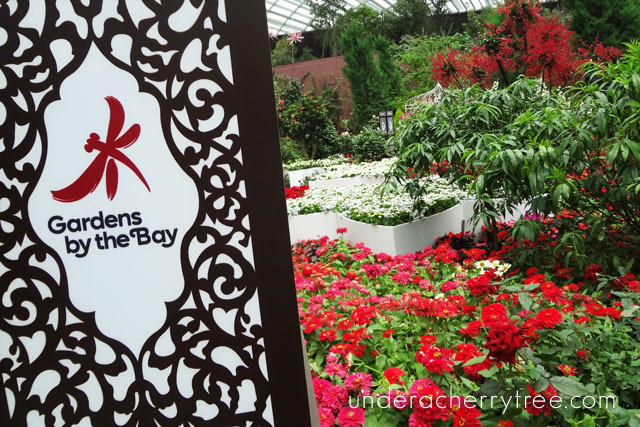 As it was within walking distance from the Gardens by the Bay, we decided to take a walk there. Here's one more look at the gardens as we strolled along the boardwalk. 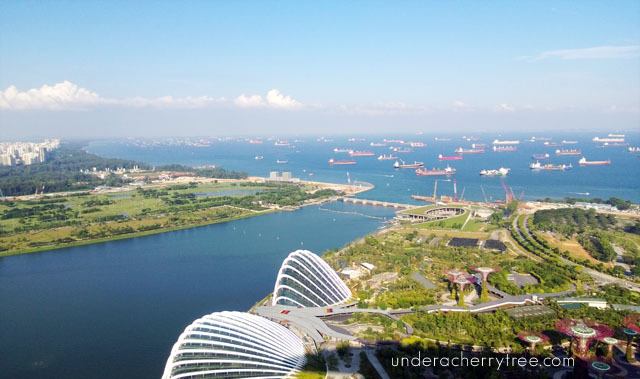 Marina Bay Sands is a resort and a casino but we really only wanted to go up to the Skypark (observation deck). Supposedly it cost the Las Vegas Sands folks S$8billion to build this "ship-hotel". It does look like a ship somehow got on top of the building, doesn't it? 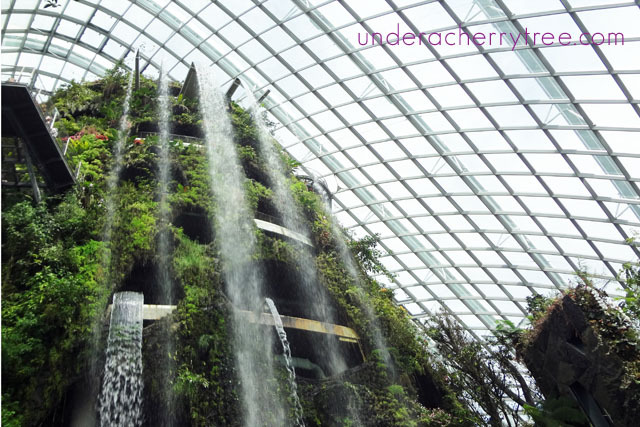 It costs S$20 per person (about US$15) to go up to the Skypark. I thought it was pretty expensive but I guess it was something we had to do- the girls really wanted to see how Singapore looks like from the top of the building. 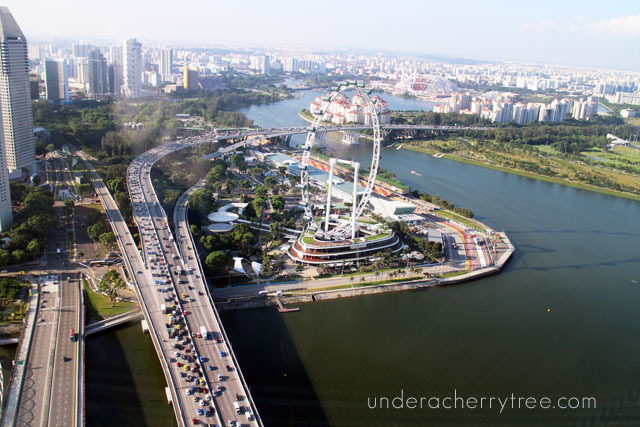 From the Skypark, we could see the Singapore Flyer- the world's largest ferris wheel. It was about 5pm when we got up to the deck and we could see the peak hour traffic down below. Here's another view from the observation deck. Can you see the Super Trees on the bottom right? By the way, Singapore is the world's leading busiest port and that should explain all the container ships in the picture below. 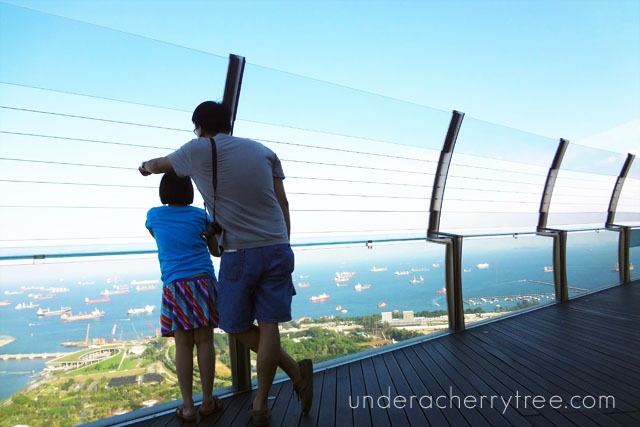 Here's a shot of the two who really REALLY wanted to go up to the Skypark - Daddy and Twin B taking in the view and making the most of out of their $20 entrance fee. 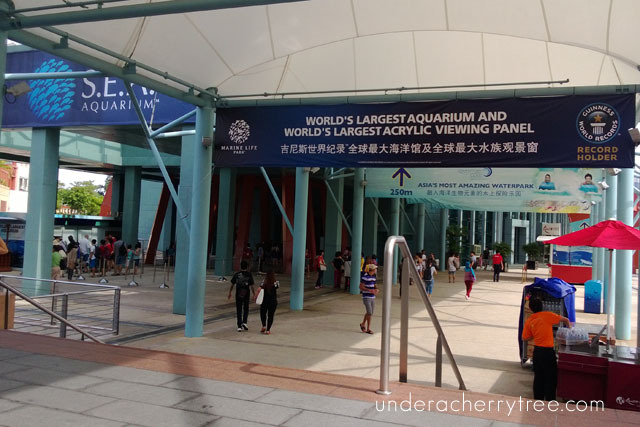 During our stay in Singapore, we also visited the Singapore Zoological Garden. 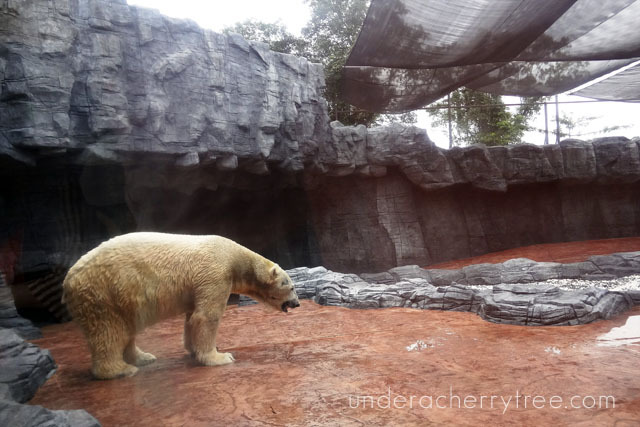 It was at the zoo where we met Inuka, the first polar bear born in the tropics. 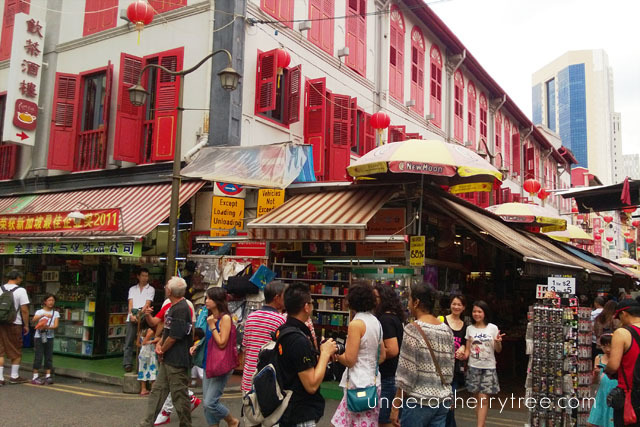 We also went through the streets of Chinatown. It was interesting to see the old buildings nested in the heart of the modern skyscrapers. 14 days came and went by quickly and I am SO PROUD of my kids for being such troopers. Despite the heat (Singapore is only 85 miles north of the Equator!) and the humidity, they handled the weather like a pro and were super adventurous in trying out new foods. Hubby and I are happy that we finally got to share with the kiddies some of our favorites treats that we grew up on. The last time that I visited Singapore was 12 years ago and so many things have changed since. Places that I used to know are either no longer there or have been replaced by something else. It was strange to feel like a local and a foreigner at the same time. I didn't feel like I know the country enough to call myself a local anymore and yet this was where I grew up. Could it be that Gotye really meant "Some country that I used to know?" instead of "Somebody that I used to know?". Probably not but if he did, he would likely be feeling the way I did. Anyway, here's hoping that it wouldn't be another 12 years before I make another trip back. There are still a lot of the island that I'd love to share with the kids. LD Back-to-School Sale plus Friday Freebie!